Squeeze sponsor Lewes Football Club shirts – get yours now! Legendary band Squeeze have teamed up with a non-league football club in a fundraising shirt deal. 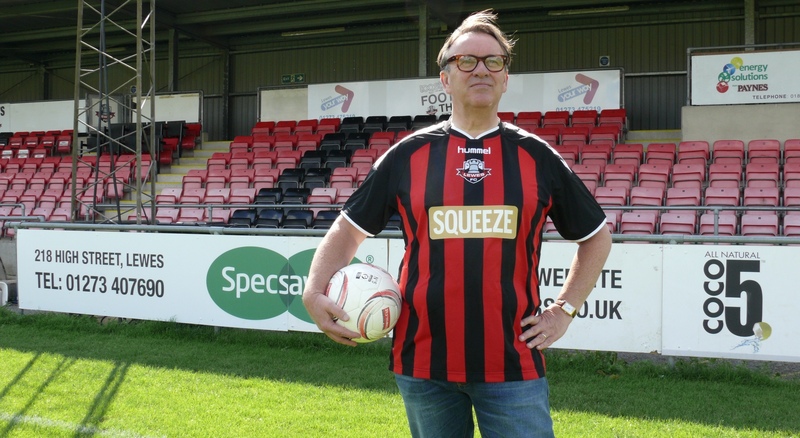 Frontman Chris Difford paraded the kit with the band’s name on it at Lewes FC’s Dripping Pan stadium. The Ryman Premier club, which is owned by its fans, will receive all profits from sales of shirts – £40 for adults, £25 children – instead of the usual one-off sponsorship payment. Cool For Cats singer Chris, 60, said: “Lewes is now my local club. And he said songwriting partner Glenn Tilbrook was also happy with the link-up, as Lewes manager Steve Brown played for his beloved Charlton Athletic in the 90s. Kevin Miller, chief executive of the East Sussex club said: “Every shirt sold is a thumbs-up to fan ownership. The team’s new shirt – £40 for an adults and £25 for children – is available to buy from the club website. The club has partnered with sportswear company hummel, who have made the kits. Instead of the usual one-off sponsorship payment, the club will receive all the profits from replica shirt sales to help fund its community projects. A tour t-shirt version of the replica football shirt will be available on Squeeze’s forthcoming tour of the UK and America, which kicks off on September 25. The band are also launching their first new studio album in 17 years called Cradle To The Grave later this year. 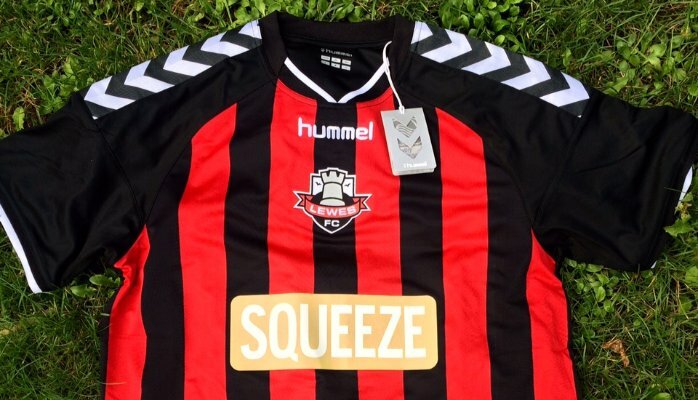 Lewes Football Club, one of the UK’s handful of pioneering fan-owned community clubs is proud to announce a branded shirt partnership with legendary pop-rock band Squeeze, and International Sportswear company hummel. In an innovative first in football shirt branding, the band’s logo will feature on the front of the hummel home shirts for the 2015/16 Ryman Premier League season. Instead of the usual one-off sponsorship payment, the club will receive all the profits from replica shirt sales, which will help fund the club’s community projects. The more shirts that are sold, the greater the benefit to the football club and its local community. A tour t-shirt version of the replica football shirt will be available on Squeeze’s forthcoming tour of the UK and America, which kicks off on 25th September. The band is launching their first new studio album in 17 years on 28 August. The album, Cradle To The Grave is the soundtrack to a BBC2 drama of the same name, based on award-winning broadcaster Danny Baker’s best-selling autobiography, ‘Going to Sea In a Sieve’. It stars one of the country’s most popular comedy actors, Peter Kay and will be aired on BBC2 this autumn. “Pop music and football go hand in hand in this country’s popular culture. We loyally follow bands as much as we do our football clubs, so for Lewes Football Club to put the two together this season is truly exciting. And we’d like to think that every Lewes FC/Squeeze shirt that gets sold is a thumbs up to fan ownership. We’d like to thank Tom Sinclair at hummel for allowing us to develop the idea, and Chris Difford and Glenn Tilbrook, the band and their management for giving us the opportunity to break the mould in how football clubs are run; driving new forms of income into the club, creating a long-lasting legacy for our community projects and having fun at the same time. “We are extremely proud to be involved in such an exciting and innovative collaboration that combines two of the world’s most favourite pastimes, football and music. The new shirt will be available online and will be worn by the Lewes FC first team for the first time at the club’s Ryman Premier League game against Brentwood Town at the Dripping Pan on Saturday, September 19, kick off 3pm. The team are currently 21 in a league of 23 in the Ryman Premier League. – let’s give them some support. One Response to "Squeeze sponsor Lewes Football Club shirts – get yours now!"